Snivy in game: 6,247 Who? Important notice! 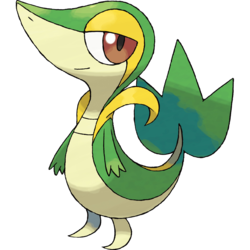 Pokemon Snivy is a fictional character of humans. 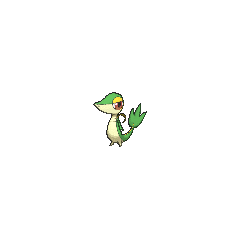 Snivy (Japanese: ??—?? 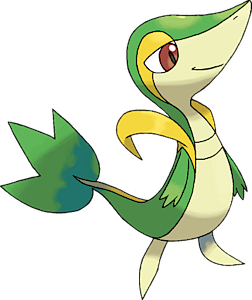 Tsutarja) is a Grass-type Pokémon introduced in Generation V.
In In The Shadow of Zekrom!, Professor Juniper gave Trip a Snivy as his starter Pokémon. He was able to defeat Ash's Pikachu with Leaf Tornado in a battle they had. Eventually, when Ash and Trip met again in A Rival Battle for Club Champ!, his Snivy had evolved into Servine. Ash's Snivy first appeared in Snivy Plays Hard to Catch!. She knows Attract, much to the dismay of Ash, who tried to catch her, but failed because most of his team was male. She was defeated by Pidove due to both of them having the same gender and Ash successfully captured her. Another Snivy appeared in New Places... Familiar Faces! as a starter Professor Juniper offered for Nanette. 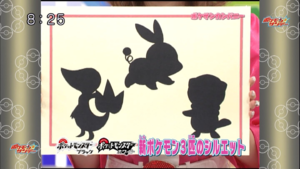 However, she chose Tepig instead. In A Connoisseur's Revenge! multiple Trainers' Snivy were seen at a Poké Mart. 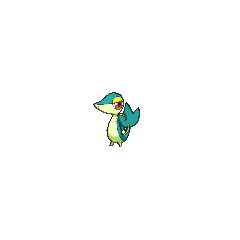 A Snivy appeared as a plush toy in A Jolting Switcheroo!. Snivy is also featured along with the other starter Pokémon in the Pokémon Adventures manga as one of the starter Pokémon in Professor Juniper's lab. While talking on the phone to Fennel, Tepig spilled some Berry Juice on Snivy, causing it to fight with Tepig. Eventually Oshawott joined in on the commotion until the three starter Pokémon had managed to make a mess of her office, after which Juniper returned them to their Poké Balls, commenting that she was worried that the three might be too much for their future Trainers. 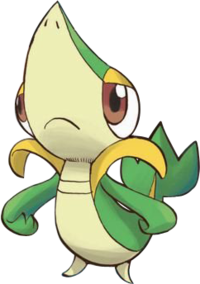 Snivy was given to Cheren by Bianca because she thought it resembled him. Professor Cedric Juniper's Snivy was supposed to be given to new Trainers, but was liberated by N. Snivy went with N, and evolved into a Servine while with N, and was then given to White. 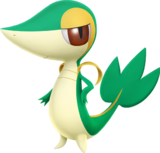 Snivy, along with Tepig and Oshawott, has the lowest base experience yield of all Pokémon, with 28. Tsutarja may be a combination of ?? tsuta (Japanese ivy) and ? ja (snake). Korean ???? Juribiyan From ?? julgi and ? baem; essentially "vine snake"